If you’re planning a big event, such as a birthday party, award ceremony or graduation party, and if there’s only a few of you doing it, there’s a lot to handle. In some cases, you have to book a venue, but if you’re doing it at home, you’ve got to tidy up and make sure there’s enough furniture, crockery, napkins and everything else for everyone who’s coming. You have to work out who to invite, and how many can attend. Although all of that is vital, perhaps the most important thing about organising a party is the catering. Cooking for private parties, weddings, corporate or community events can be very stressful. You have to take plenty into account such as what everyone likes to eat and drink, how many will be there and whether you’ve enough to go round. To plan for such an event takes a lot of time and effort, and you hope that it’s all been worth it. A lot of time goes into cooking, especially when it comes to meat, and a normal oven, grill, pan or barbecue grill can only take so much, and if you’re doing too much at once, the meat could easily end up being burnt beyond edibility. Luckily, we at Spitting Pig have the perfect solution to those problems. 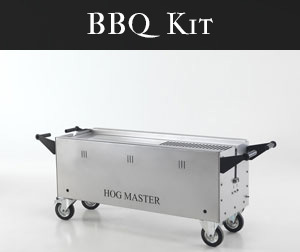 If you need to cook a lot of meat for, say, a village fete and want a hog roast in Kilkenny, and you don’t want to rely on using a complicated and unreliable barbecue grill to cook for dozens of locals, then hiring a hog roasting machine from us is the answer. For a very reasonable sum, you get full use of one of our state-of-the-art machines for a whole week, which is ideal if you’re involved in running a local arts festival or if you’ve got family staying over and want to give them something special. 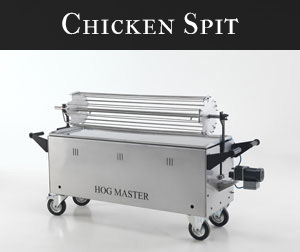 Our machines can cook a whole pig or similarly large amounts of meat and poultry, and are very easy to use. Unlike with an oven or grill, you don’t have to preheat to use it, and you can put the pig straight onto the machine. It cooks the meat slowly, evenly and thoroughly for around six hours, meaning that when it’s ready, you get the tastiest meat imaginable, and you can serve it straight from the machine to your plate. As well as being able to cook a whole pig, you’re able to cook whole legs of lamb or beef, four whole chickens or two whole turkeys. Its versatility makes it a winner at all sorts of events, from the biggest community event with a hog roast in Tipperary to the smallest family gathering when you need a hog roast in Monaghan. If you’re struggling to decide what to cook for your event, for a little extra, we’ll throw in a pig ready to cook. In addition to that, as the machines are easy to use, very little can go wrong. If you’re roasting or grilling meat, it can become over or undercooked very easily, but spit-roasted meat comes out perfect every time, so even if you’re the most inexperienced hog roasting novice, you can’t get it wrong. Hiring a machine means that you get to do whatever you like with it (at least when cooking meat is concerned). You can add glazes, marinades and even garnishes like streaky bacon to your pig, joint or bird, and, if you’re a budding chef, then hiring one gives you the opportunity to develop your skills and learn a new cooking technique. The machines we hire out are exactly like the ones we use when we’re on catering jobs for weddings, corporate events and private parties. From business lunches to retirement parties, we’ve had plenty of praise heaped upon us for the quality of our spit-roasted pigs, and the equipment we use helps us to create the most mouth watering spit-roasted meat known to man. 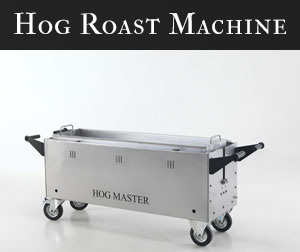 Our machines have never let us down, and we hope that your excursion into hog roast catering is as enjoyable as every catering job we’ve ever done.Hiring a hog roasting machine makes perfect sense if you’re holding a celebration of some sort, but you want something a little different from the usual barbecue or buffet fare. You can cook more with a machine, and it cooks it better. Our machines are ideal for both indoor and outdoor catering from the smallest back garden to the biggest village hall, and as they’re easy to use, it means that just about anyone can use one.